It’s a well-known fact that a woman’s handbag has everything except the kitchen sink, but it does make you wonder whether those handbags might need a purse organizer. While it’s convenient to be able to carry everything that you might need for any occasion, it can also be a battle to find it when you need it. From lip balm and tissues through to hair clips and chewing gum, all manner of items find their way into a woman’s handbag for the long haul. While all these items might come in handy, they aren’t conveniently nearby at a moment’s notice. Most handbags for women on the market are designed to be able to fit as much as possible into them, but this can often be at the cost of an organizational aspect. There might be one or two liner pockets or a zipped pocket on the outside, but the majority of the inside is an open space. If your handbag is beginning to look like that junk drawer everyone has at home, it might not only be time for a cleanout but an opportunity to purchase a purse organizer as well. Purse organizers come in a range of shapes, sizes, styles, and colors to suit a variety of different handbags. They sit neatly in the interior of your bag and help you to organize your items more conveniently. Check out any of these nine purse organizers below if you want to add a better sense of order to your purse or handbag. Available in a range of colors to tie in seamlessly with the color of your handbag, this purse organizer from ZTUJO will add a new sense of order to your life. It’s made of high-quality felt, is versatile to suit a range of handbags, and won’t stand out. As a result, it looks like part of your bag, opposed to an additional component. The felt is rigid yet flexible, it’s lightweight, and it provides 13 pockets to house all of your handbag items perfectly. As a result, you’re able to access the smallest of things with just a quick glance. What you’re also sure to love about these felt purse organizers is the size range. Choose from medium, large, and extra-large, and benefit from a better sense of order in your handbag. Unlike some other purse organizers on the market, they are made from felt for a reason. Rather than risk delicate items such as spectacles, sunglasses and phone screens from becoming scratched or damaged, the felt ensures it fits snugly and securely with no abrasive resistance. They are well priced, suit a range of items such as mobile phones, makeup, and more, and will be a welcome addition to your currently disorganized handbag. If you’re looking for a versatile, well-made purse organizer to add a sense of order to your handbag, this CEEWA organizer can help. Designed to turn the most untidy of bags into an organizational paradise, it’s a quality item worth your consideration. This organizer is made of flexible yet robust felt, comes in a range of colors and sizes, and is designed to fit into most handbags. As a result, it’s a favorite product in the marketplace. When you’re tired of never being able to find anything in your handbag, purchasing a purse organizer such as this one is a must. With several different pockets, you can neatly store every item for easy access at a moment’s nice. From notebooks and glasses through to mobile phones and wallets, nothing will be lost in the dark depths of your handbag. Because of the color variations on offer, you can also rest assured this purse organizer will never look out of place. Purchase the color that suits your handbag the best, insert it, then add your items. It has never been easier to add organization to your life. 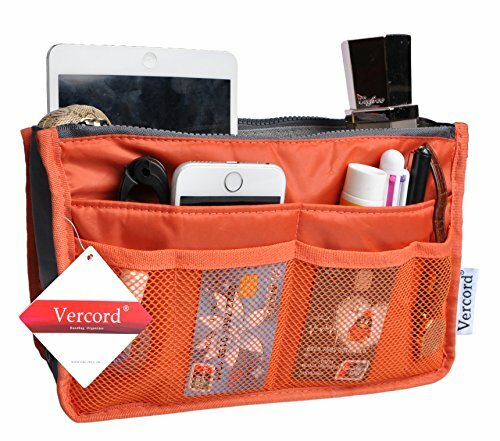 Available in a small, medium, or large size, this purse organizer from Vercord may tick all the boxes for your handbag organization requirements. There are several colors to choose from to ensure you get the one that suits your bag the best while ticking all the boxes for functionality, quality, and storage options as well. The material is the first thing you’ll notice when considering this organizer for your bag. It’s sturdy, robust, and is a water-resistant nylon fabric that will last the distance. As a result, all items contained within it are sure to last the distance as well. What’s more, this purse organizer has so many pockets you’re sure to find very convenient. From zipper and mesh pockets through to large and small pockets, there are 13 in total ready to house all those essential items you typically lose in a handbag. The best part is, it’s suitable for many different kinds of handbags, and can also double up as a toilet bag or storage organizer at the office. Functional, versatile, and affordable, this Vercord purse organizer will add a new element of order and organization to your life. If you’re an avid lover and collector of handbags but hate having to transfer items from one to the next all the time, then it might be time to invest in a purse organizer from Lexsion. Designed to make handbag organization a breeze, it’s a high-quality felt organizer that easily lifts out of one bag and into the next. It’s available in several different colors to tie into the color schemes of various bags, comes in four different sizes, and transforms your level of organization in an instant. Find out how big your bag is, choose a purse organizer to suit, and reap the rewards of being able to find all of your handbag items easily. 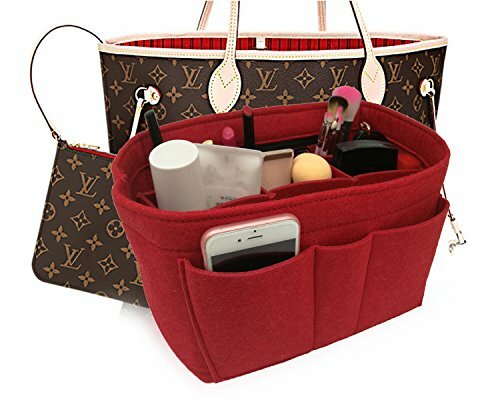 What many users love about this purse organizer, aside from its affordability, is how effortlessly it caters to all everyday handbag items. 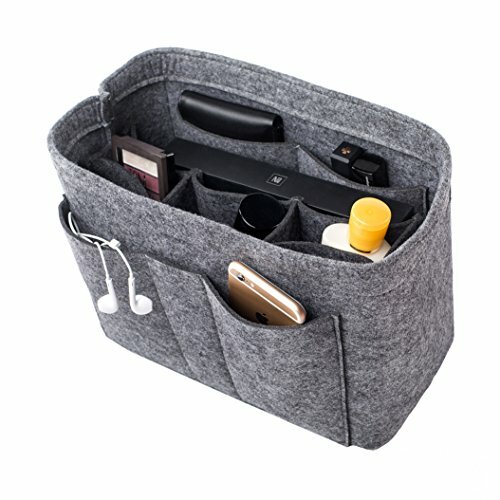 From glasses and notebooks through to makeup, mobile phones and more, whatever you typically carry is what this organizer can house. It has 12 pockets comprising four exterior and eight interior and even has a set of middle pockets you can either leave in or remove. This enables the organizer to cater to larger items as well. It’s lightweight, durable, folds down when not in use, and will be a much-loved addition to your handbag collection. Owning a big handbag is a blessing thanks to its ability to carry a range of different items, but it could be even better with a purse organizer. Rather than spend hours over time searching for the tiniest lost things hidden in the dark depths of the bag, you can instead location the item with one glance. 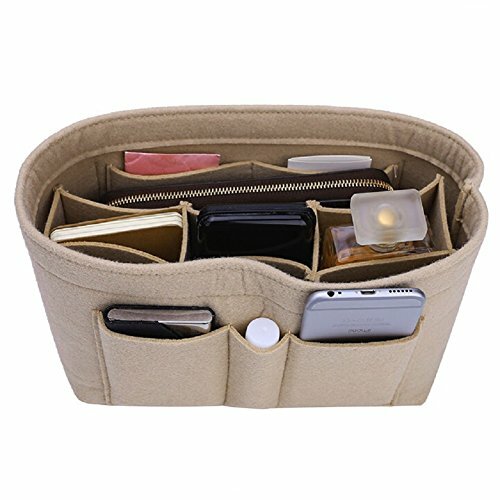 This felt insert purse organizer from VANCORE could be that very organizer you require. It’s made of lightweight felt fabric, comes in a range of different colors to suit your handbag style, and is easy to remove. As a result, you can lift it out and put it into a different handbag without having to empty all of the items out first. Adding additional convenience are the nine pockets which house all different items. It has one large pocket, four small side pockets for easy-to-lose items such as earrings and jewelry, and four liner pockets as well. It also has two buckles to close it, holes to grab onto when you’re lifting it out of the handbag and is robust to handle daily use. 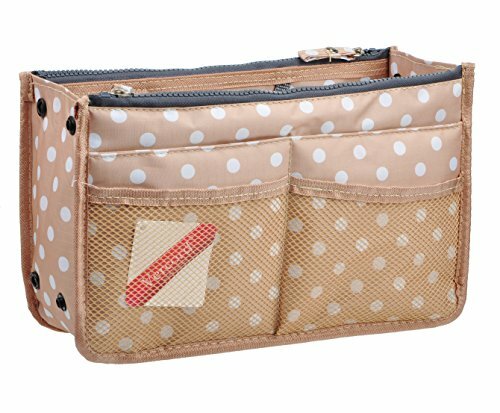 Available for an affordable price tag, you will experience no end of convenience when you purchase this purse organizer from VANCORE. One of the robust materials on the market today is canvas, and this comes in handy when you’re looking to buy a purse organizer. 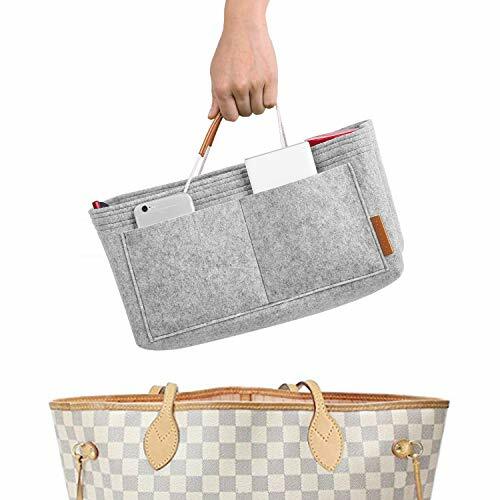 If you want one that lasts the distance, can be moved from one handbag to the next and is affordable as well, this Vercord canvas handbag organizer is the answer. It has a canvas outer shell with a polyester lining, is available in blue, gray, beige and green, and even comes in various sizes to suit your exact handbag as well. This purse organizer ticks all the boxes before you even find out what other features it has to offer. What will most certainly impress are the storage options on offer. While your handbag is sure to feature a few pockets, this purse organizer will take it one step further. In one convenient bag, you have access to 13 pockets – all of which will help to organize the many items you carry around in your handbag daily. It has one large pocket for bulky items, two side and two back pockets, one at the front and five on the inside. Each of these will prove useful for the safe storage of mobile phones, make up, medication, and more. No longer do you have to spend a long time digging into the bottom of your bag for that elusive lip balm. Instead, open your bag, and it will reveal itself to you immediately. Organize your handbag and feel more organized in life. 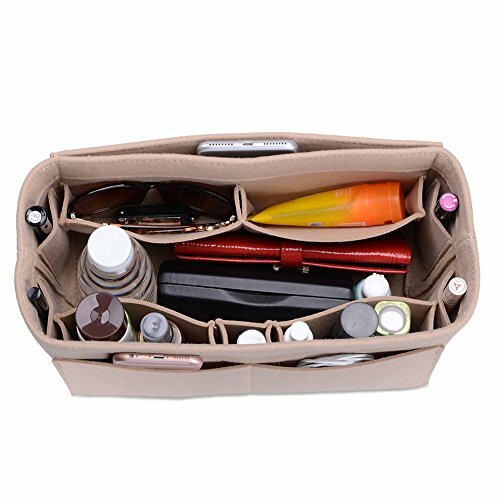 This purse organizer could be the very thing you require to add a sense of order and organization to your handbag. It’s suitable for a range of bags, can be a standalone organizer for at home or the office, and is robust enough to last the distance. There’s every reason why this purse organizer will tick all the boxes. It’s made of hardy felt in a stunning contemporary gray color, ties in beautifully with many handbag styles, and has 11 different pockets to cater to your every need as well. Instead of rifling through your bag to find what you’re after, you can instead store each item into one of the many pockets and spot it at a glance. There are eight pockets on the inside and three on the outside for your convenience. Unlike other purse organizers on the market, this one also features handles to make transport a breeze. Instead of spending a long time tipping items out of one bag into the next, you can lift the purse organizer out and transfer it over to a new bag. It takes just seconds, and your bag will continue to be organized for many months to come. What’s more, both small and large items are catered for, and this lightweight organizer will fit them all in neatly. It’s affordable, robust, and built to last, so consider adding it to your wish list today. What will also impress is how many pockets it has. It has 12 pockets in total which are made up of inner, outer and side pockets, and even includes two felt bottle holders to keep them upright in your handbag. As a result, you never have to worry about them leaking and ruining other handbag items. One of the most commonly lost items in a handbag is your car keys, but this purse organizer takes care of them too. It comes with a key strap with a swivel clip so each time you clip them into your handbag, you will always know where they are. Save so much time instead of rifling through your bag for those smaller items. The inner pockets are also gusseted which means they hold more things, and it even has slit handles to make moving it from one bag to the next far easier. 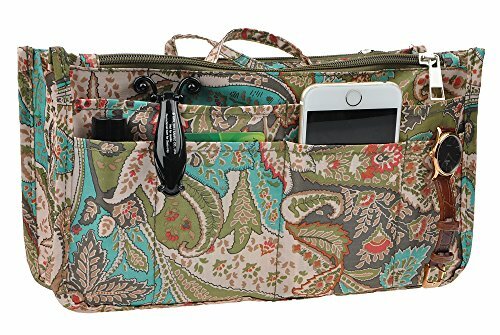 This purse organizer is incredible value and is jam-packed full of features for your convenience. With many different colors to choose from, this Dahlia purse organizer will become a favorite item for your handbag in no time. It’s made of durable nylon, is self-standing, and features various pockets to keep all of your things safe and secure. What sets this purse organizer apart from others is how it bucks the trend with storage features. It has a card holder for your most-used card to avoid having to rustle through your wallet, a keychain for your keys, and has both open and zippered pockets. Keep smaller items secure, so they don’t get lost, and ensure larger pieces remain in place at all times. 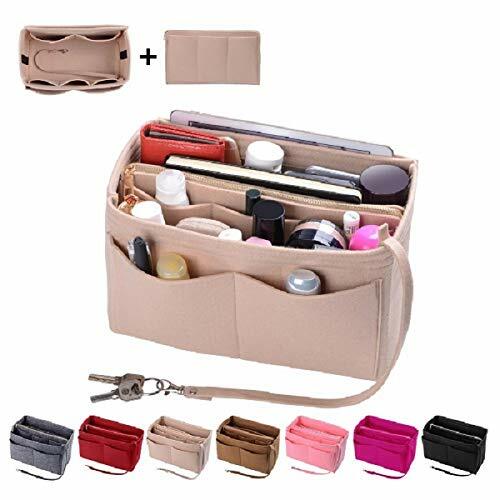 This organizer fits neatly into many different handbags, can be removed and put into a separate bag quickly and efficiently, and will change the way in which you organize your handbag items. It’s a convenient product you are sure to enjoy.